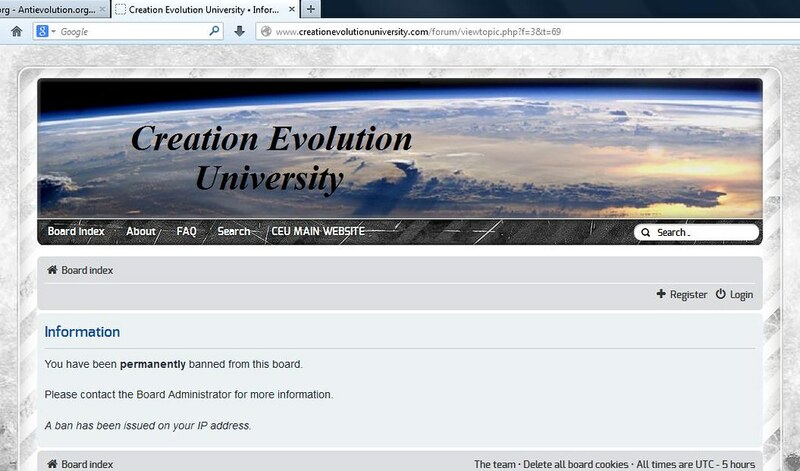 Shitstain Sal has now silently and permanently banned Thorton from his new CEU site after publicly posting that Thorton wouldn't have his voice suppressed and could still start threads. I know because I was posting there as Thorton. Human shitstain Sal Cordova, a shining example for Creationists everywhere. I just posted this thread at Sal's forum. He maintains you are only "uninvited" from threads by their authors. You are cordially invited to this one. Just a little experiment. Anyone want to bet on the outcome? He's a lying little shitstain as always. I just navigated to the site and once again got this, the identical message that has popped up ever since he silently banned me. �I can't even view the site let alone post there. Feel free to post it there and call the shitstain's bluff.